There's a topic that I've touched on a few times over the years here, but I've never really delved into it. It's something that comes up pretty frequently in discussions of children's health, particularly when talking about vaccines or so-called alternative medicine. It's even something that arises around issues of which real treatment a child should receive. I've mentioned it in passing in posts about vaccines (e.g., when talking about why it actually does matter to others if you vaccinate your child, how anti-vaccine people want to change legislation, or how they oppose what they see as government interference), as well as my discussion about a case involving controversy over competing diagnoses. Others have also written about it in the context of cancer treatment. A common element in all of these topics is autonomy: the right to make decisions about one's own healthcare. More specifically, do parents own their children? Do parents have the freedom and the right to do with their children as they please? Or are parents merely guardians and stewards for their children until they are mature enough to make decisions on their own? Where do parental rights end and the child's rights begin? Recently, this notion came up again in response to a post on Reddit, in which a mother, who is opposed to vaccines and did not vaccinate any of her children, relates how she discovered her eldest daughter got herself vaccinated in secret, much to the mother's chagrin. She asks if she can take any legal action. The July 8, 2015 post to the legal advice subreddit was eventually removed, but not before garnering a robust response. Many comments were along the lines of praising the daughter for taking her health into her own hands. Others heaped insult onto the parents for not protecting their children. And quite a few pointed out that given the girl's age (16 years), she is fully entitled to make her own health care decisions without her parents' consent. None of my children are vaccinated. Totally by accident I came to find out that my oldest daughter has been fully vaccinated (Tetanus, diphtheria, pertussis, polio, measles, mumps, rubella, hep a and b, menengitis a and b and hpv) without mine or my husband's knowledge or consent. In Ontario we have socialized medicine and publicly funded vaccines. She admitted she went to clinics run for school aged children run by our local health public health unit to get her shots and also got a few at a local walk in clinic that are not yet publicly funded paid for with her babysitting money. When I called public health and the clinic to complain they both said that because she is age 16 they cannot release any information to me - and I'm her mother! My husband and are livid that she was vaccinated without our consent. What kind of action can we take against public health and the clinic for vaccinating a child without parental consent? Do we have a case for a lawsuit? For those who support vaccines, it's a great story: a teenage act of rebellion where the teen is the smart one, taking her health into her own hands. There is some question as to whether this story is actually true or not. There are details that cast doubt on it, such as the idea of the girl paying for any of the vaccines with her babysitting money. Canada has universal healthcare, which covers all routine vaccinations. While some private clinics would charge for a vaccine, they are uncommon, and many of the nurses and doctors staffing a walk-in clinic are still covered by the Ontario Health Insurance Plan. There's also the username of the poster: "momquestionthrowaway". 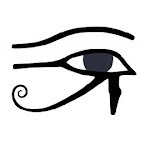 And then the whole story seems too absurd and outlandish to be real. None of this means it did not happen, but there are reasons to doubt and no means of verifying the elements of the story. But what about the essence of the post? Whether the story is true or not, it brings up an important question: do the parents have a right to their daughter's medical records? 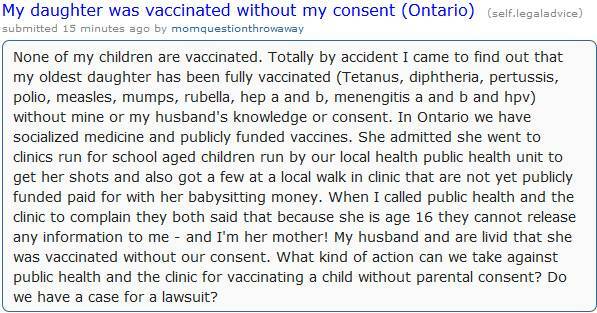 Do they have a right to legal action against the clinics for vaccinating their daughter without their consent? Do the parents' rights supersede their daughter's right to privacy and autonomy over her own healthcare? Capacity to consent is, in many locations, not so much a matter of ability as it is of arbitrary age cut-offs set by law. For instance, in the United States, as far as the law is concerned, you are incapable of safely operating a car unsupervised until you are 16. Likewise, you can't consent to working conditions or contracts until you're at least 16, and in some cases not until you are 18. Only when you reach 18 are you considered an adult, capable of making your own decisions and even altering how our country functions (via voting). But you cannot make decisions, legally, about drinking alcoholic beverages until you are 21 years old, despite the fact that, in all other regards, you are legally an adult. Then there are the varying ages allowed by the states for possession and unsupervised operation of a firearm. For example, while Federal law limits the sale of firearms by a licensed dealer to only those aged 21 or older, Montana state law allows anyone at least 14 years old to possess and use a rifle without adult supervision. As far as the legal question in the Reddit story goes, per Ontario law, anyone who is at least 16 years old has guaranteed medical autonomy, barring any conditions or disorders that impair their decision-making capacity. That means that as soon as a child turns 16, they can make their own medical decisions and their medical records are a private matter between the child and their doctor. The mother in the story has no legal right to view her daughter's records nor to take action against the clinics or the provincial Department of Public Health for complying with her daughter's wishes. But what if she were 15 years old? Would her parents have a right then? Not necessarily. While Ontario law guarantees autonomy once a person reaches 16 years of age, the province is one of several that recognizes that the ability to make medical decisions for oneself is not a simple matter of age. They employ a "mature minor" standard in that there is no statutory minimum age required for a child to consent to medical treatment on their own. If, in the physician's judgment, the child understands the nature and consequences of their decision, then they are capable of making the choice for themselves, without any other input from the parents. Before her parents would be able to obtain the medical records relating to her autonomous decision or to take action against the clinics, her parents would need to challenge her capacity as a mature minor in court. In short, they would need to demonstrate that she did not understand the nature or consequences of her decision and that she is therefore unfit to make her own medical decisions. I'm admittedly simplifying the issues somewhat for purposes of this post; there are nuances to the law and its interpretation and enforcement. But at least from a legal viewpoint in Ontario, parents do not have an automatic right to dictate what medical procedures their children do and do not get. But what about the ethical angle? Regardless of what the law says, should a parent have unfettered control over their child's healthcare decisions? Should a child be considered completely autonomous and allowed to make decisions without the consent of their parents? I'm sure that there are some parents who would answer "yes" to the first question and "definitely not" to the second. Conversely, there are some children who would answer just the opposite. From an ethical perspective, the answer to both questions would tend toward "no", though more realistically, the answer is, "it depends". Some research notes that adolescents are capable of making informed medical decisions by the time they are 14 years old. They are mature enough to understand the magnitude of their decisions. Other research argues that people are not fully cognitively developed until they are 21 years old. Obviously, there is variation from individual to individual, and from situation to situation. A child may be capable of an informed medical choice at a young age, where they are free of peer (or parental) influence and the consequences are limited in severity. The same child may be incapable of making a medical decision for themselves when they are under the strong influence of friends or their parents, or where the outcomes are of such a great magnitude that the child is incapable of fully understanding. Whether a child is mature enough to make their own medical decisions, whether to accept or refuse treatment, depends on the child and the situation. However, if the child can demonstrate that they understand, that they truly comprehend their situation and the options available, then from an ethical standpoint, they ought to be able to give or refuse consent, without the intervention of their parents. They are individuals in their own right, and as such are deserving of respect as an individual. They are not objects owned by their parents. They are not chattel for the parents to do with as they please. They are individual human beings. In an ideal world, parents and their children would make medical decisions together, and when the child is mature enough, whether as early as 14 or not until they are legally adults at 18, decision making moves into their hands. But no matter what age a child begins deciding for themselves, the parent does not have an absolute right over their child. When it comes to medical decisions, the parent has an obligation to do what is in the best interests of their child, even if that decisions is at odds with the parent's wishes, as is the case with vaccines and parents opposed to vaccination. Likewise, within the parent-child-doctor relationship, the doctor's duty is to the child, not to the parents. It may be difficult for parents to accept that their children are growing up, that their kids do not need them anymore. And it can be even harder for some parents to view their children as individuals capable of making their own decisions rather than property, to put aside their own desires and beliefs in deference to what is objectively best for their child. Unfortunately, there is no hard and fast rule, no clear cutoff point at which we can say, "This person is now capable of making informed medical decisions on their own." It is a complex issue that is very situation-dependent. But at the very least, we can respect that parents do not own their children, no matter what misguided Kentucky politicians might say. Parents are not free to do with their children as they please, because children are not property. They are not owned. Children have rights, too. That includes the right to protect themselves when their parents fail to do so.